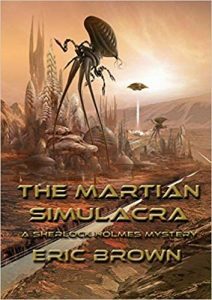 The Martian Simulacra, Eric Brown (NewCon Press) January 2018. The End of All Our Exploring, F. Brett Cox (Fairwood Press) August 2018. Godfall and Other Stories, Sandra M. Odell (Hydra House) April 2018. There’s another Martian novella from NewCon Press, after Jaime Fenn’s excellent The Mar­tian Job. 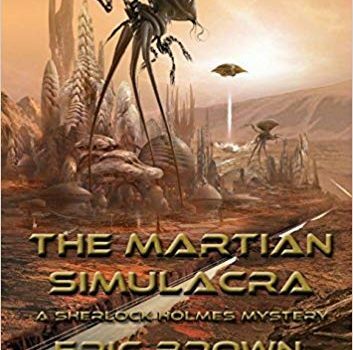 This one, The Martian Simulacra by Eric Brown, is more of a mixed bag. It’s a mashup of Conan Doyle and H.G. Wells, with Sherlock Holmes invited to Mars to solve the murder of a Martian philosopher, in a 1907 where the Martians of The War of the Worlds have returned with an immunization against Earth viruses, and have taken over in a more overtly peaceful fashion – they are rulers, but they offer advanced technology. 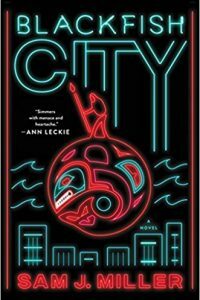 The story itself is an adventure romp, with some fun, if extremely implausible, sequences. Alas, the prose is weak (another copyediting pass would have done wonders, but also the fitful attempts to mimic Doyle’s voice just don’t work), and Holmes himself comes across as flat and mostly ineffective. There’s a fetching and strong woman at the center of both the story and the resistance to the Martians, but if you want a convincing portrait of powerful women giving Holmes as much as he can deal with, without making him negligible, I’d suggest you try Theodora Goss’s The Strange Case of the Alchemist’s Daughter instead. It’s nice to see a generous collection of stories from F. Brett Cox, a fine, quiet writer whose intensely varied stories, always imbued with an American sense of place, have been appearing for decades, but whose work might be overlooked by many readers because he hasn’t published a novel. There are two new stories here, different enough from each other to give a sense of his range: “Elimination of Restraint and Seclusion” is a short and mordantly funny piece about the humane treatment of zombies, while the title story, “The End of All Our Exploring“, is a more serious character work. It’s presented as a letter from a gay man in Vermont to his husband, who has left him and returned to his home in South Carolina in the wake of a civilization-threatening pandemic. (Cox is from South Carolina and lives in Vermont, by the way.) The story is effectively about the two men and their relationship, and about the changes to the US because of the plague. Another new collection is Godfall, from Sandra M. Odell. I’m less familiar with her work, but it’s evident from the new stories in the book that she writes pretty searingly when she wants to. The best was “The Home for Broken“, in which a couple have decided to let their “broken” child be taken to a special home. The husband is present when the Home’s representative arrives, and tries to assure her how much they love this child, condemning himself at each step. The child is presented as different in a striking way – she’s clockwork and needs to be wound. This actualized metaphor works powerfully, and the story is devastating. “Good Boy” has a horrific slant – the “Change” has uplifted dogs so that they control humans in much the way humans control dogs, and the protagonist is a fighting human, and his degraded state is terrifying, though, to an extent, I thought the story a bit overprogrammed.